"Sewing the Petals to the Skirt"
we need to gather the top edges. 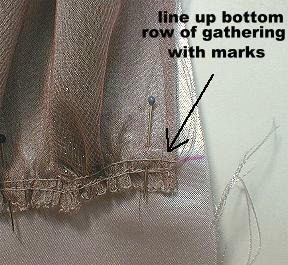 place 2 rows of gathering stitches along the top edge of each row of petals. 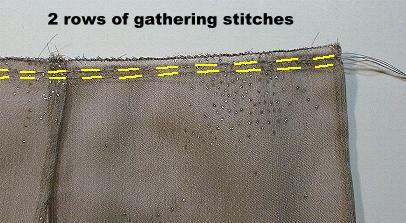 The first row of gathering stitches should be 1/8" from the finished edge. The second row 1/4" from the edge. which will be pulled as a pair. For now, do not gather the petals. 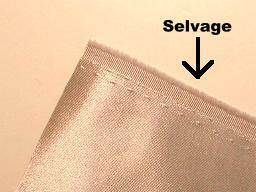 is always parallel to the selvage or finished edge of the fabric. For your skirt front the grain line is the center front marked FOLD. 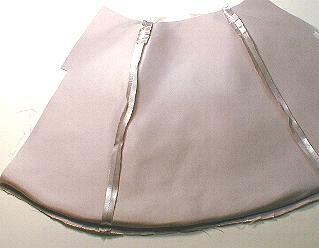 The skirt back is the same, the center back is the grain line. 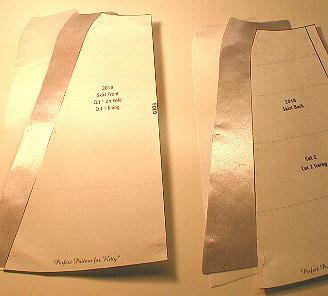 cutting directions on the pattern pieces. Cut linings. 3. Stitch skirt front to skirt back at side seams. 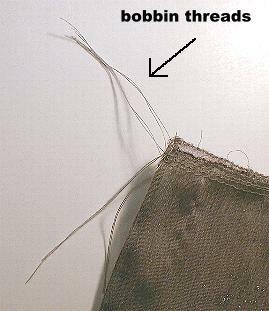 along the bottom hem edge only. 5. 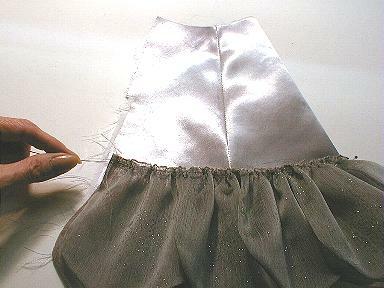 Turn the skirt and press the hem edge. but bear with me, we need the hem edge completed at this point. 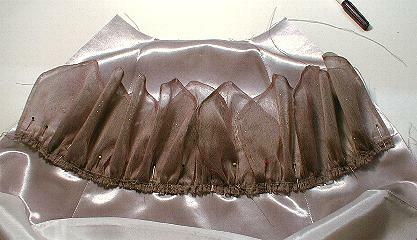 skirt won't show between the petals after the row is gathered and sewn on. 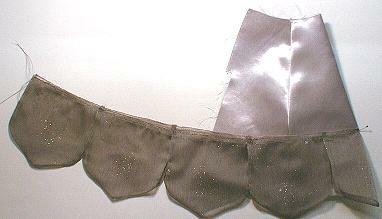 bottom petal points should overhang the hem of the skirt by about 1 inch. 8. 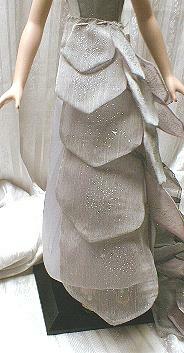 After marking where each petal row will be placed, remove the skirt from the doll. 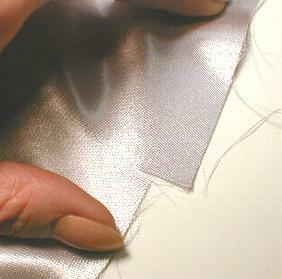 9. using pins or a fabric marker, measure and mark your stitching lines. is viewed on the doll, from the back)*. 11. Trim the extension off. extension when the skirt is finished. but it is only personal choice. follow your own inclinations. For the moment, we will leave the skirt and go back to the petals. and insure that the gathering is evenly spaced all in one easy step. We will start with the bottom row of largest petals (#5) and work our way up. 12. 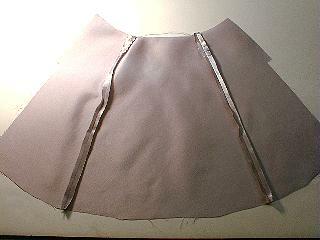 Fold the skirt in half. Fold the row of petals in half. 13. Separate the bobbin threads (if you stitched your gathering threads from the top side of the petals, your bobbin threads will be on the underside). 14. Pulling evenly on all four bobbin threads at the same time, gather the row of petals until it fits the marked stitching lines on the skirt. 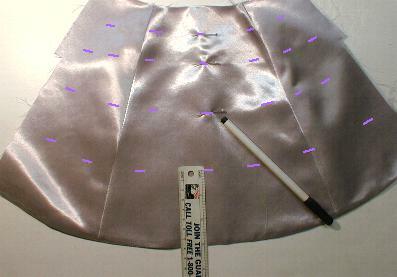 The row of petals will be gathered down to 1/4" shorter on each end than the skirt to leave room to seam the skirt. 15. Adjust the gathers across the row of petals evenly. 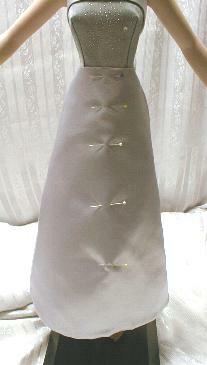 (right sides together), upsidedown to the stitching line on the skirt. Follow these instructions for each row of petals up to the row of #2 petals.